When you think about ultra-long hauls we usually think Asia, the Middle East and Oceania. But flights to South America can be almost as long. A nonstop journey between Los Angeles and Sao Paulo is clocked just under 13 hours. That’s even longer than a flight from the west coast to Seoul. A journey from the east coast can be almost as tedious – about 12 hours for flights to Buenos Aires or Santiago de Chile. That’s a long time to spend in a cramped economy seat. Practically all major airlines including Delta, American, United and Air Canada offer new business class products with lie-flat seats to the southern parts of South America. In addition Avianca group also features lie-flat seats on its flights to the U.S. and on some routes within South America. Panama City based Copa is practically the only major airline featuring old reclining chairs, but its longest flight to the U.S. (New York) is under six hours. While the continent has plenty of marvelous destinations, there are not as many major international airports as in Europe or Asia. The most important airports of South America for a leisure traveler are Buenos Aires, Santiago de Chile, Sao Paulo, Rio de Janeiro, Lima and Bogota. That may not feel as if you have a lot of choices, but you really do. American is known for its fluid availability of premium class awards to South America. It can be near zero one day and full of life the next one. 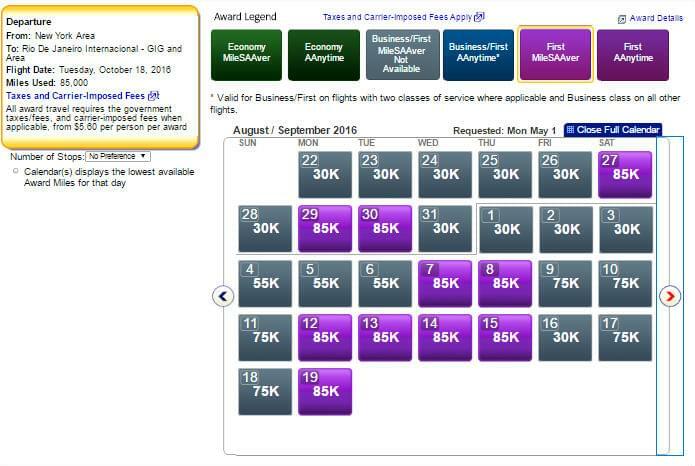 With all unpredictability, however, it’s possible to get two tickets in business class (American is cutting down on the use of three cabin aircraft, which is a common industry trend). You need to book well ahead, however, and it can help if you don’t mind a connection in Miami. The screenshots below show availability for two people. At the time of writing, American has excellent first class availability from Miami to Rio in the late fall, but you might feel that paying 85,000 miles for a relatively short flight (about seven hours) might be excessive. United availability is also not easy to predict, but it has more routes to South America, and some hubs are better than others. While finding two nonstop business class tickets from its major departure hub in Houston might be a bit hard sometimes, there are other options. For example, there is a good availability for two people from Washington, DC to Sao Paulo for the next spring and early summer. In addition, United has Star partners, such as Air Canada, Avianca and Copa, although Copa should be avoided due to old reclining seats as we’ve mentioned earlier. Alaska availability to South America is only as good as American and Delta, and neither of these airlines shares all its award space with partners. 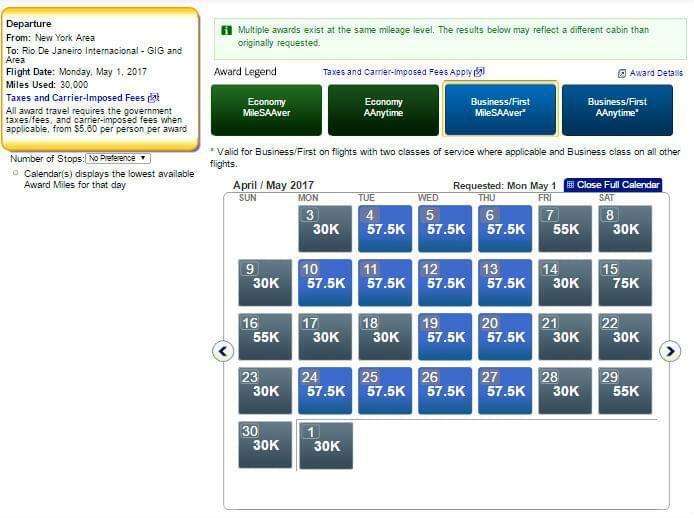 Alaska also has access to LAN award inventory, but finding two business seats on LAN can be tough. Try to look for LAN availability on BA.com first. In the end, Alaska availability is good, but not great. Region definitions vary somewhat between the carriers, but all of them put Argentina, Chile and Brazil to Southern South America, and Peru, and Columbia to Northern South America. All redemption levels are oneway except for Delta. The only exception is AA that puts a Brazilian city of Manaus to Northern South America. Here are the redemption rates for Alaska, Alaska has separate charts for every partner that flies to South America: American, Delta and LAN. Alaska uses predevaluation American levels that offer amazing values as long as you can find availability. And, at 45,000 miles, LAN has the best value for flights to Southern South America, but finding LAN award space is not easy as we’ve mentioned before. Alaska also uses the old Delta levels to Southern South America (Delta has increased its business class levels from 62,500 to 75,000 miles after October 1, which is why we haven’t included Delta for our comparison). Using Alaska miles to book Delta can be an excellent deal as Delta has some good availability between certain city pairs. Alaska doesn’t allow one-way flights at 50% miles when you redeem for Delta, but instead you can utilize Alaska amazing stopover rules. There are no surcharges for flights to South America. American: Oneway travel is allowed, can’t cross the third region (can’t route to southern South America via Northern South America), no free stopovers. United: Oneway travel is allowed, one free stopover, up to two open jaws (subject to more restrictive stopover rules for flights booked after October 5). Alaska: One free stopover in each direction, even on oneway ticket. Alaska us a hands down winner in this category. You can visit three destinations on the same award ticket, and there are no artificial routing restrictions. Alaska beats American and United in almost every category except availability, but even then United wins only barely. If you can use Alaska miles to fly American, you will be redeeming at old award levels that are much better than the current chart that’s been used by American since the devaluation. Furthermore, Alaska opens up limitless possibilities for stopovers. You can even use a stopover domestically, for example, fly from New York to Miami, and stop for a few days before continuing on your journey). You can also use a stopover domestically in a foreign country – fly to Lima and stay there for a few days before continuing to Machu Picchu. To find out how to earn tens of thousands of Alaska miles follow this link.